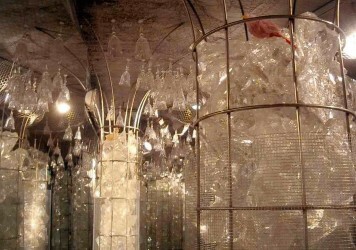 Did you know that nowadays Colle Val d'Elsa can be easily considered the world's crystal capital? About 95% of Italian production and about 15% of world-class crystal quality production comes from our beloved city. Tradition was rooted in the 19th century when an Alsatian genius master, Francois Mathis, came to the Val d'Elsa to establish his activity because of the abundant natural presence in our areas of key elements for this craftmanship, such as lumber, quartz, manganese and barium. That was how the first fruit of what is today in all respects a tradition and an art that has created high quality objects that embellish household houses in the form of glasses or all kinds or carafe or ornaments and decorative objects all over the world but also receive honors from the art world by representing their glassmasters in permanent collections around the world such as the New York MoMA ( look here ). In this matter, the Museo del Cristallo museum represents a unique opportunity to deepen the historical and artistic journey that has shaped the existence of world class glassmakers and consequently even our city. The museum will offer you an interesting and constructive route through the products, the faces, the techniques and the history of this incredible art, another product of the meeting of human genius and typically Tuscan ability that brought glassmaking to levels of excellence. You can visit this amazing space from Tuesdays to Sundays ( mondays closed ) from 10 a.m. to 18 p.m. or visit their website ( www.museodelcristallo.it ) for all the info about prices or reservations. do not miss the chance to save a little time of your holidays in Colle Val d’Elsa to purchase some crystral objects made here, various artisans’ shops will offer every kind of ornaments for your house, from crystal glasses to enrich your toasts to bottles or classy ideas for your gifts. This art, which is now more than ever practiced and thriving, is born in the fertile land of beauty, art and culture, of human wonders and wisdom which is Tuscany, a true wonder in which the excellence of nature and the noblest part of the human skills meet.